How to make blockchain and crypto reach the mainstream? 2018 was the year when Blockchain and Bitcoin were on the cover of every newspaper and a common topic of discussion at dinner tables. In 2019, the conversation has moved back from mom and dad talking about digital currency over meatloaf to developers trying to solve the tough problem, how to make make blockchain usable for consumers. You can catch a video version highlighting this discussion from Benjamin Bollen, OST’s Chief Blockchain Strategist, speaking at the Ethereum Community Conference in Paris. Blockchain futurists spend a lot of time discussing blockchain powering decentralized apps. Decentralized Applications may represent a blockchain future where the internet is a “decentralized appstore” in which anyone can publish their unstoppable apps (dapps). Today however, apps such as Gmail or Uber require centralized management to function. These are mainstream apps–with wide adoption and with large user bases–that don’t currently have tokenization or blockchain features like smart contracts defining the core functionality. For now, a decentralized future isn’t a concern for mainstream apps, whose chief concerns are user adoption, retention, and engagement. However, blockchain can still bring new levels of decentralization to existing mainstream applications. For example, many people already have property insurance applications on their phone. Blockchain could link a registry of real estate transactions with these applications to issue new policies. To make these work, blockchain uses a high level of security that often requires such friction as a 12 word key. For creating a seamless UX for actual humans and not just super users with engineering backgrounds, we have some development work that needs to be done. For example, what happens if I lose my private key? How do you add additional parties to the contract or share decision rights, say to your realtor, accountant, or partner. Currently, we use offline tools like a paper power-of-attorney to accomplish this. Realizing the blockchain future is going to require some innovative solutions to marry an easy user experience with the technology. While there are blockchain first applications out there you do not see mainstream adoption yet. The main reasons for this, Sean Howell LGBT Foundation CEO explains, are “lack of concrete user value-add and poor user experience (UX).” The issue is also rooted in a lack of technology on which it is easy to add blockchain functionality inside mainstream apps. “It is difficult for developers to fully address this without abandoning focus from making the best products possible for their existing users, investing in a stronger tech stack to enable a better user experience.” This is why LGBT Foundation in conjunction with launch partner Hornet chose OST Platform’s customer focused technology solution to bring LGBT Tokens to its tens of millions of users in the largest mainstream launch of its kind. We will further discuss the technical features, the blockchain infrastructure , and more importantly the user needs driving this project. Ethereum is an open-source, public, blockchain-based distributed computing platform and operating system featuring smart contract (scripting) functionality. Ether is a token whose blockchain is generated by the Ethereum platform. Smart contracts are digital contracts that can execute agreed upon actions. They are implemented as code, not manually by people, which carries out the actions and enforces obligations of the parties involved. These kinds of contracts can help on-chain applications (blockchain, tokens and cryptocurrency) interface with off-chain applications (Gmail, Doordash, Lyft). What is the benefit of using OST Platform for this? Setting up blockchain infrastructure is an expensive and complicated ordeal. The LGBT Foundation has certainly been on the lookout for a solution that handles this for them. OST is that solution. Mainstream apps often focus on their core purpose, in the case of Lyft, getting you where you need to go. OST Platform is a bridge for mainstream apps to integrate blockchain; it enables all types of businesses create their own Brand Tokens, helping them set up their own crypto based economy on the Ethereum network. Many current blockchain-first-apps are experiments, complicated and cumbersome for end users. On the other hand, apps like MyTaxi, Grab, Uber meet the standard user functionality sometimes modeled as “Jobs To be Done“, which meet a high degree of functionality, ease, and user objective. In other words, a good app gets me to where I need to go, without a lot of thinking on the rider’s part. OST Platform offers the LGBT Foundation and ecosystem the ability to launch a unique token, in our case the LGBT Token, securely. It also allows us to avoid the headache of setting up our own complex blockchain infrastructure and meeting the regulatory requirements and costs that go along with launching an ICO. We found OST to be a best in class solution far ahead of the industry in developing simple blockchain tools for non-blockchain developers . For a more detailed account of this decision you can read our analysis here. Choosing a bridge to Ethereum like the OST Platform allows us to launch the LGBT Token on a platform others already know and trust. Mainstream app developers have a job to get done–improve user engagement through user delight. When you hear user delight, it refers to any positive emotional affect that a user may have when interacting with a device or interface. In a straightforward way, this can often mean these four user needs: pleasurable, usable, reliable, functional. This is why usability is the foundation for delightful experiences. 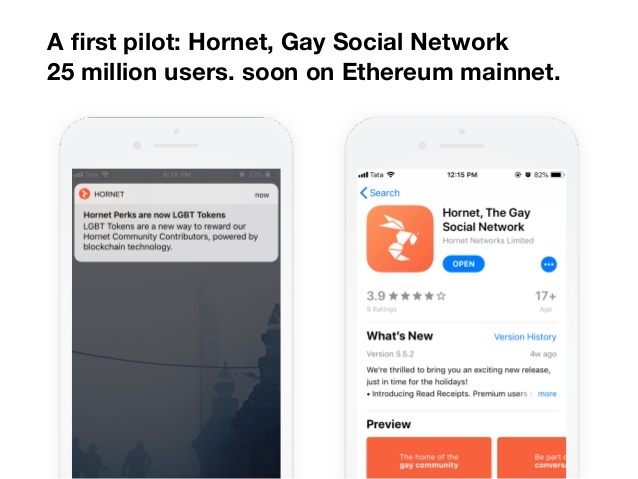 To reach a huge target audience for the LGBT Token, our partner is Hornet, the gay social network with 25 million users, soon on Ethereum Mainnet! Hornet, the world’s premier gay social network, was founded in 2011 with the mission to build the digital home for the LGBTQ+ community. In that time, Hornet’s global platform has grown to 25 million diverse community members. Hornet helps people make meaningful connections in a refreshingly friendly environment filled with award-winning, original content and news around lifestyle, travel, entertainment and social justice. Hornet has scale, for example 13 billion messages where sent across Hornet in 2017 and increasingly more. Moving these many users and a mainstream app’s token economy to the Ethereum mainnet is a big deal. It’s an implementation beyond hype and headlines that becomes a solid use-case for blockchain and crypto. 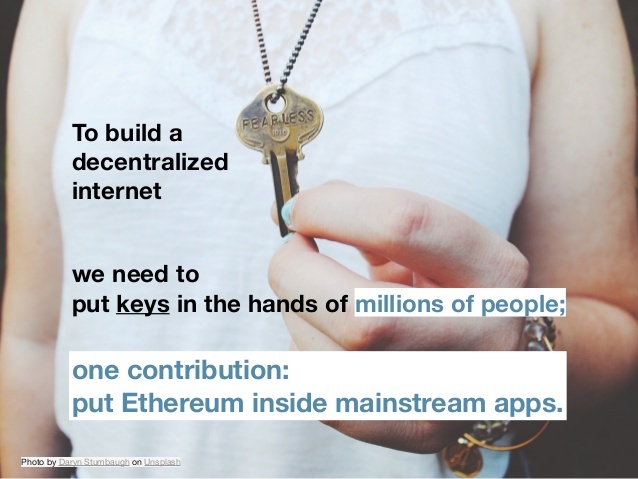 The mainnet is the main network of Ethereum where actual transactions take place on a distributed ledger, that means it is a distributed system, unlike today’s world where many middlemen have authority over activities; in addition many blockchain pilots still exist on a the testnet, or test network, where new dapps are tested and developed in an environment without consequences– these allows testing of experimental features. Testnet coins are separate and distinct from actual coins, and are never supposed to have any value. While it is great to think about the highly technical and architectural elements happening on the backend servers, users want this app to work without seeing this, and experiencing as little friction as possible, blockchain and crypto should enhance the experience, not take away from it, and not require any hard technical knowledge to use any new elements powered by blockchain. For the mainstream consumer, learning about the ins and outs of crypto is like asking them to know internet protocols before using a web browser or sending an email–keep it simple for the end experience. Let’s Get Technical… How to make this work? One of the key features making blockchain use desirable is around security. At the core of this is complex keys used to protect your authority. A seed phrase, seed recovery phrase or backup seed phrase is a list of words which store all the information needed to recover a Bitcoin or token wallet. Blockchain digital wallets will typically generate a seed phrase and instruct the user to write it down on paper and memorize it. This allows recovery of your wallet if your computer breaks or your lose your phone. You can download the wallet software on a new device and use the recovery phrase to restore your coins for example. By design, each word in the dictionary is assigned a number, which converts the seed phrase into a number. The English-language wordlist for the BIP39 standard has 2048 words, so when the phrase contains only 12 random words, the number of possible combinations would be 2048^12 = 2^132 and the phrase would have 132 bits of security, that translates to (5.4445179e+39), reducing for some lack of randomness it comes out to 128 bits, most experts argue this is sufficiently secure. For the engineers, this can seem like an ideal solution. However, for most everyday users, doing this kind of work, memorization and new long code origination–perhaps needing multiple recovery phrases–becomes from cumbersome to impossible. One alternative to this clunkiness that is already in use is the six digit PIN, making wallets simple. Many consumers are familiar using a four digit pin which has 10,000 possible combinations, offering a degree of security when coupled with delays between guesses and locking the account after a certain number of wrong guesses like on an Iphone. A four digit PIN has 10,000 possible combinations, which can be easy to break using electronic methods. However, a six digit PIN has 1 million possible combinations. Working with our launch partners, such as Hornet, their users want a wallet that works easily with best in class tech, as customer support services, and employing the OST Platform’s Wallet solution allows this. For the LGBT Token, OST Platform’s Wallet SDK provides high security with great usability through a combination of 6 digit pin and smart contracts. The OST Wallet SDK enables the creation of LGBT Wallets for end-users to seamlessly and securely use LGBT Tokens. The Wallet SDK provides user authentication, private key management, and easy recovery features that enables users to transact with LGBT Tokens in a secure and user-friendly way. With the LGBT Wallet Hornet users will fully control their LGBT tokens with keys managed natively within their mobile devices. To create an LGBT Token Wallet, Hornet users will need to set a 6 digit PIN. After setting their PIN users will also have the option to immediately set up biometric authentication for convenient wallet use. This 6 digit PIN secures access to sensitive operations such as authorizing transactions, authorizing new devices and viewing the mnemonic phrase. The PIN also allows users to authorize extended sessions during which period users can approve transactions without reauthorizing with their PIN. This provides an experience similar to logging into venmo or other payment apps to transfer funds without being prompted to approve every transaction. 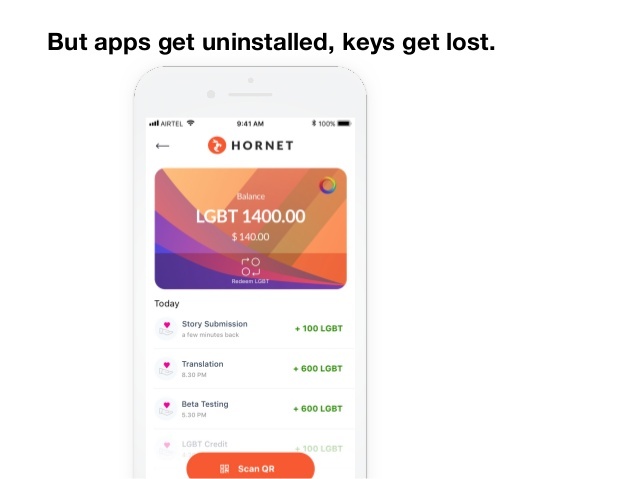 To protect users from losing access to their funds if they lose their device, Hornet users will be able to recover their LGBT Wallet by entering their PIN on a new device. They will also have the ability to set up their wallet on multiple devices. All of this provides convenient alternatives to writing down a 12-word seed phrase or private key. As the 6 digit PIN, on its own, does not provide enough entropy to be secure, the recovery process combines the PIN entered with mapped inputs from the LGBT Foundation and OST. The recovery smart contract (known as the delayedRecoveryModule) enforces a 12 hour waiting period during which the user can abort the recovery request using any of their authorized devices, further protecting the user from malicious recovery requests. With an Ethereum smart contract, a delay on recoveries can prevent brute force attacks. Current thinking is a 12 hour delay for recovery prevents fraud the same way a bank prevents fraud by suspending your credit card is when it notices suspicious payments until you check in with the issuer. Launching on OST Platform makes this technology easy to use for LGBT consumers. This design allows a secure and happy environment for the everyday consumer to enjoy the benefits of blockchain and tokens while making it frictionless to enjoy. Marrying tough technology and UX brings us to the LGBT Token – Hurray! With all this work building a stack and experience, we deliver a LGBT Token wallet and experience for the Hornet user that is on the surface simple and familiar as opposed to the underlying technology previously described. For example, let’s look at how the security features and benefits discussed earlier play out within the LGBT Token wallet. As discussed the gold standards for security are 12 word phrases and multiple devices. Yet if we applied these standards to online banking, especially for small transactions, many consumers would rather go to the store. New technologies must be utilities and bridges making transactions easier to grow user adoption base and familiarity. Technology sophistication can only grow in line with user familiarity. The LGBT Wallet gives users the choice over their own level of security while implementing minimum security requirements to ensure adequate protection for small accounts. As user sophistication grows they can configure their settings to fit their needs. The goal is to have use of the LBGT Token this become a seamless experience for users, that is quick, secure, and scales for enabling more and more transactions and users. Blockchain futurists dream of and envision an Ethereum internet or web3 — a safe, easy to use decentralized internet, bound by a common set of economic protocols, and used by billions of people. This requires innovative solutions (off-chain or layer 2) until new critical infrastructure is built; Ethereum’s big scaling challenge is transaction throughput. Today, Ethereum processes 15 transactions per second, while in comparison Mastercard processes approximately 45,000/tps. The core limitation is that public blockchains like Ethereum require every transaction to be processed by every single node in the network. Imagine, all operations such as a payment or a new smart contract, must be performed on all the nodes of the network–this design makes the transaction authoritative. We need more efficiency here. Layer 2 solutions create smart solutions to address these issues. Sharding is a concept that’s widely used in databases, to make them more efficient. A shard is a horizontal portion of a database, with each shard stored in a separate server instance. This spreads the load and makes the database more efficient. The OpenST Protocol functions as a layer-2 scaling and sharding solution for Ethereum, allowing for transposing ownership of tokens from Ethereum to different utility blockchains and back. This framework is designed to enable businesses with tens of millions of customers to safely and securely benefit from having their own token economies on highly scalable open blockchains (offloading high transaction volumes off of public Ethereum and onto auxiliary utility chains). This second layer of economic mechanisms can extend the utility of public blockchains outwards, letting us have interactions off of the blockchain that can still reliably refer back to that core kernel if necessary. The LGBT Foundation is a nonprofit organization with a mission to bring crypto to the global pink economy in order to empower an underserved market. By harnessing the power and potential of blockchain technology and other technological innovations, the Foundation aims to foster greater acceptance of the LGBT community, drive positive social change for the benefit of its members, and protect vulnerable LGBT community members. LGBT Token will activate the $4.6 trillion global LGBT+ economy, enabling members to assert and protect their LGBT+ identity, creating a new medium of exchange and loyalty for LGBT+ persons and businesses, and making a global social impact by allocating resources to projects that the LGBT+ community cares about, including tackling oppression, discrimination and inequality, education and healthcare. Putting the LGBT Token in wallets of millions of users uplifts a huge number of users into the crypto space. Approximately 10 million users are on Coinbase, giving token wallets to Hornet’s 25 million users and educating them on the basics of crypto helps increase the use of blockchain in the LGBT community and also making this one of the biggest blockchain distribution milestones while embracing the ideals of the community.